You are currently browsing the tag archive for the ‘Alice Comedy’ tag. ‘Alice the Whaler’ was one of the last of the Alice Comedies. It was only followed by two other titles, before Alice was replaced by Oswald the Lucky Rabbit. It features Lois Hardwick as Alice, who had replaced Margie Gay at the end of 1926. ‘Alice the Whaler’ is a cartoon that consists of rather unrelated gags. This time Alice and the gang are on a ship, looking for whales. In this cartoon both Disney’s character designs as the flexible animation have matured. Gone are the goggly eyes, and even one character (a cat cook) is wearing Mickey Mouse-type gloves. Also starring is a small mouse that peels potatoes just the way Mickey would do a year later in ‘Steamboat Willie‘. Alice has almost disappeared from the screen, by now: she’s visible in four shots only, two total shots of the ships and two close ups that contain no animation whatsoever. Indeed, in his next series, Walt Disney would abandon live action altogether, relying on animation only, which by now already was the best in the business. Two dog catchers, a bear and a mouse, catch a whole school of dogs. They also lure some dogs using a girl dog on a balcony. They all end in a prison-like sausage factory, which contains a death chamber. We see a dog actually walk in there (after having been salvaged by a dog priest). He comes out as a string of sausages… Luckily, detectives Alice (Margie Gay) and Julius free all remaining dogs. This cartoon contains quite some flexible animation, especially of the bear emptying the school. Alice (Virginia Davis) and her friend Julius the cat are on a safari in the jungle. 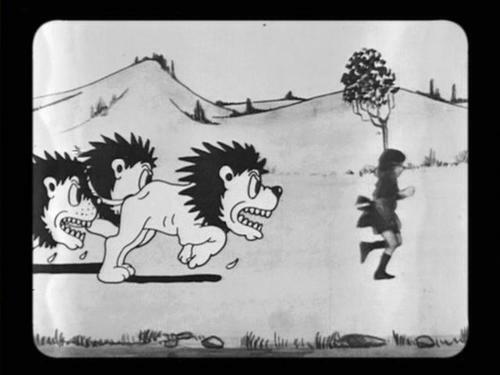 The cartoon consists of several unrelated gags: Julius encounters some crocodiles, two elephants go bathing, Julius makes a barber sign post out of a tiger’s tail, and both Alice and Julius are chased by lions (a scene similar to the finale of Alice’s pilot cartoon). 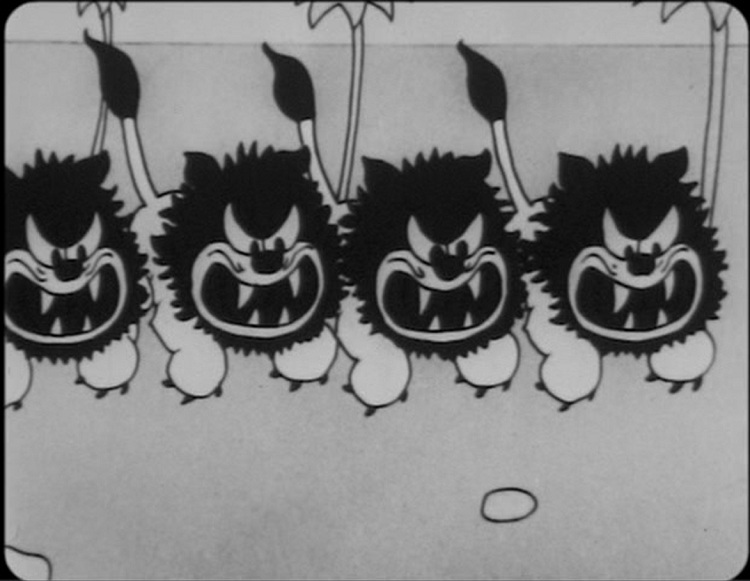 The cartoon contains many surreal gags, a lot of them unashamedly Felix the Cat-like, especially when Julius uses his comic expressions and balloons as tools. Alice’s role, however, is extremely limited here. This is no surprise, for ‘Alice in the Jungle’ is made around leftover footage of Virginia Davis, who, after some salary problems, had been replaced by Margie Gay in early 1925. Alice is at school singing out of tune and blowing a balloon that contains ink. When it explodes in the teacher’s face, Alice is cornered. There she falls asleep. Alice dreams she’s making music with a cat, a dog and a donkey, until they are being attacked by a evil horned teacher and three anthropomorphized schoolbooks called ‘reading’, ‘writing’ and ‘arithmetic’. The cat invents a canon to shoot pepper with. The first shot is successful, but the second one explodes in their faces, so Alice and the gang are sneezing their heads off. At that point Alice awakes. ‘Alice Gets in Dutch’ is a rather unremarkable entry in the Alice Comedies series. None of the animation in this short is particularly noteworthy, although the animation of the cat thinking up an invention looks quite good. This cat character would eventually evolve into Alice’s main sidekick, the very Felix the Cat-like Julius. The technique of combining live action and drawings suffers in this short; at some scenes Alice is rendered so light, she’s almost invisible. ‘Alice’s Wonderland’ is the pilot film for the Alice cartoons, which Disney made in Kansas city, before trying his luck in Hollywood. Alice (the four year old Virginia Davis) drops by the studio and tells Walt Disney she likes to watch him drawing some funnies. 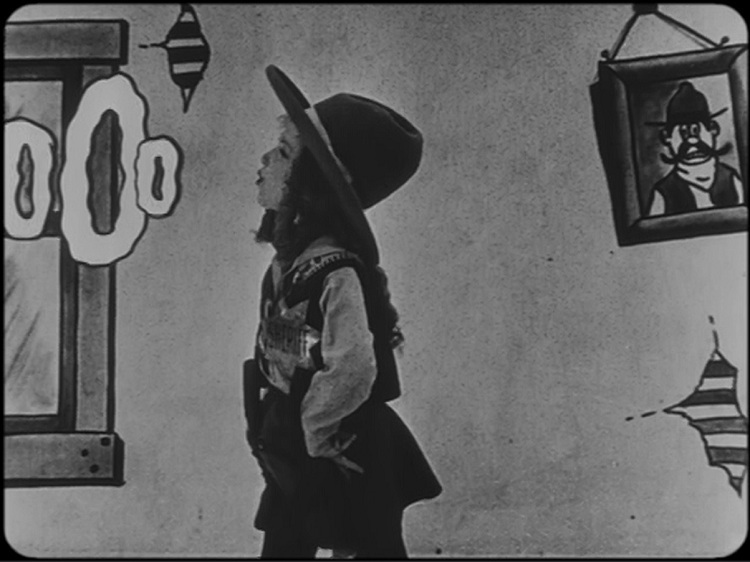 Walt Disney lacks his familiar mustache in this sequence, but he is already the kind entertainer of children here, and he takes her to a sheet of paper on where a cat chases a dog out of a dog house. 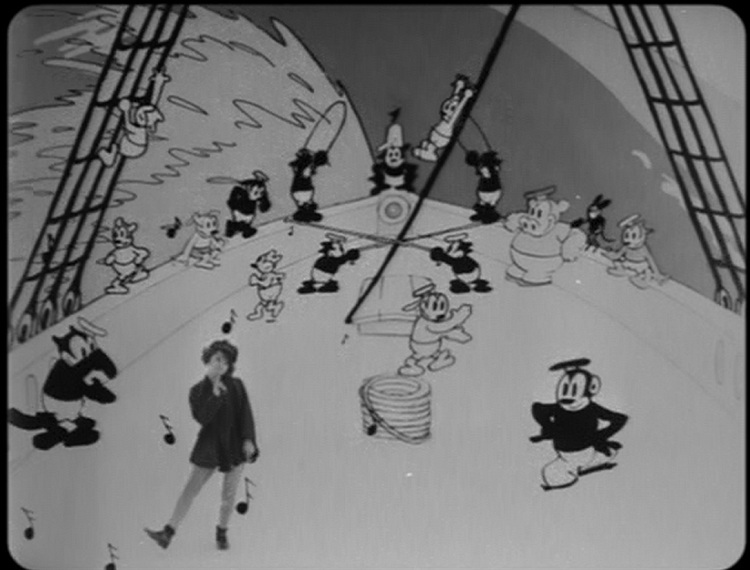 The rest of the studio is also populated by animators (Iwerks, Harman, Ising and Maxwell all appear in this cartoon) and toons alike. The whole crew ‘s watching a boxing match between a dog and a cat, for example. That night Alice dreams she arrives in cartoonland by train. She’s welcomed by animals and she performs a little dance for them. Unfortunately four lions break out of Cartoonland Zoo and they chase her into a tree, into a cave, into a rabbit hole and finally, to a cliff. She falls off the cliff, and then she awakes. This cartoon is very entertaining. The idea of a girl in a cartoon (the inverse of the idea of Fleischer’s Out of the Inkwell, a series that was around for eight years by then) works wonderfully, and the cartoon is lively. 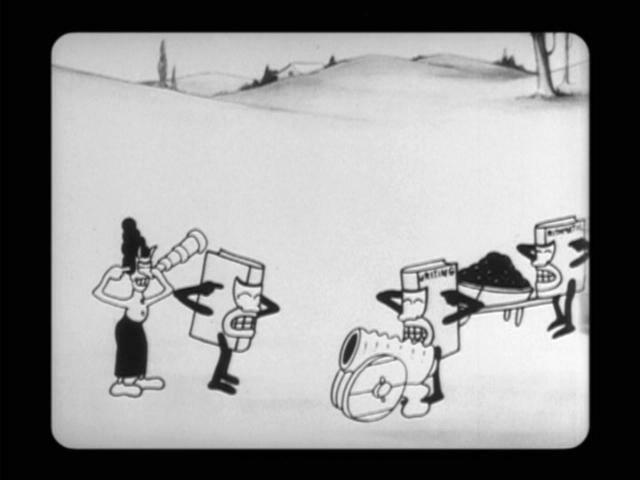 It already contains lots of music and dance, and a very rubbery animated train, besides the normal stiff animation you find in most cartoons of the twenties. The animation of the train looks forward to the flexible animation style that would later make Ub Iwerks and Walt Disney famous. Luckily, Disney was able to sell the Alice series, starting his Hollywood career. His fledgling studio released 56 Alice Comedies in the next four years, until the series was replaced by Oswald the Lucky Rabbit in 1927. The series was quite successful, allowing Disney to expand and to improve. In that sense, ‘Alice’s Wonderland’ lay the foundation of the Disney imperium.